Brian O’ Driscoll is a former Irish professional Rugby Union player. Brian O'Driscoll was the captain of the Ireland Rugby team from 2004 -2012 and captained Leinster Rugby from 2005 until the end of 2008 season. He captained the British and Irish Lions for their 2005 tour of New Zealand. Registered at University College Dublin RFC, he played at outside centre for the Irish provincial team Leinster. 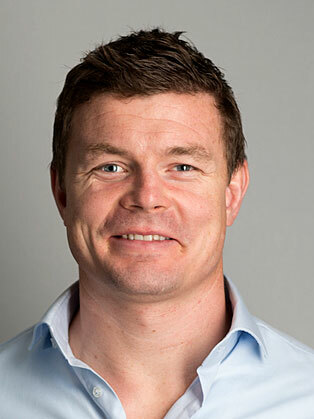 Brian O'Driscoll is the most-capped player in rugby union history, having played 141 test matches – 133 for Ireland (83 as captain), and 8 for the British and Irish Lions. He scored 46 tries for Ireland and 1 try for the Lions in 2001, making him the highest try scorer of all time in Irish Rugby. He is the 8th- highest try scorer in international rugby union history, and the highest scoring centre of all time. O'Driscoll holds the Six Nations record for most tries scored with 26. He has scored the most Heineken Cup tries (30) for an Irishman. O'Driscoll was chosen as Player of the Tournament in the 2006, 2007 and 2009 Six Nations Championships. His final appearance for Leinster, and for any team, was in the 2014 Pro12 Grand Final on 31 May in Leinster's home ground, the RDS in Dublin, where Leinster defeated the Glasgow Warriors 34-12. He now works in a number of different capacities both in Sport and in the Business world.